Starchitect Daniel Libeskind has done it again, bisecting Dresden’s historical Museum of Military History with one of his signature angular additions. The transparent glass and steel structure rises five storeys, extending beyond the current building in a manner that can only be described as dramatic. The addition’s tip points poignantly towards the direction where a series of destructive World War II bombs were dropped years ago. Libeskind’s addition commemorates the reopening of the war museum after a 22 year closure. The neo-classical building was originally an arsenal for the German Armed forces, so Libeskind designed the angular wedge to symbolize the grave disruption in German military history by the Nazi era. The pointed addition extends all five floors of galleries, and adds an observation deck for visitors to take in the Dresden skyline. The transparent wedge brings daylight from all angles into each floor of the historic building and the outer shell is encased by a screen of thin steel rods, which filter in the daylight. A second, larger steel grid inside provides structural support and a distinctive pattern to the wedge. The halls and floors below the new addition are angled as well, with thin strips of skylights that leak daylight into the hallways below. New exhibitions including the first German submarine, the Brandtaucher, built in 1850, will be shown in Libeskind’s addition, which is separated by exposed concrete from the historic galleries. More vulgar shape-making from Libeskind, arguably the world's worst, most over-rated architect. 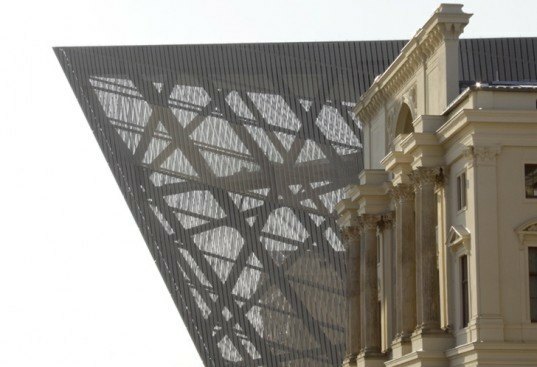 Libeskind's tenuous claim to fame has nothing to do with great design, but rather his hostile defacement of fine traditional architecture with meaningless and intellectually empty wedges and shards. No surprise that this talentless charlatan and fraud who was fired from the World Trade Center project paid another architect to design his own home. The museum seems to have developed a horrendous steel and glass tumor. Deconstructivism is nothing more than the plaything of intellectual impostors and academics. The sharpened protrusion is invasive and very uninspiring as if like a knife blade attacking people to keep them at bay. It begs the question as to why we spend so much money on buildings that are so deliberately anti-social. But complaining about 'starchitects' is similar to complaining about over hyped handbags, both are luxury goods whose price has more to do with people who have more money than they do sense. 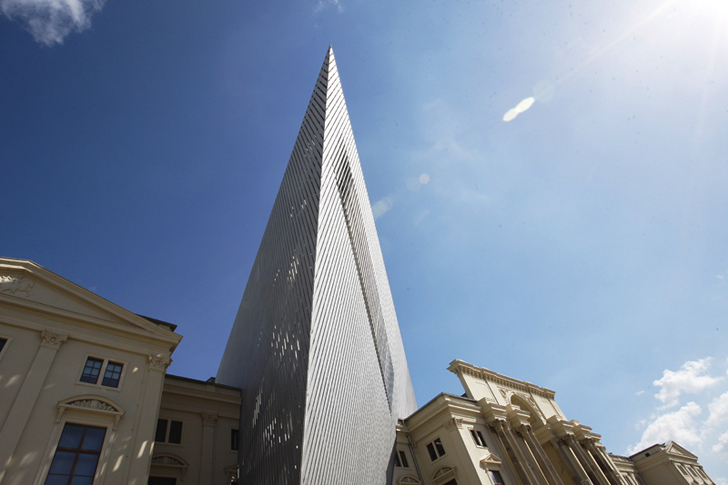 Libeskind’s addition commemorates the reopening of the war museum, after a 22 year closure. The neo-classical building was originally an arsenal for the German Armed forces, so Libeskind designed the angular wedge to symbolize the grave disruption in German military history by the Nazi era. The pointed addition extends the five floors of galleries, and adds an observation deck for visitors to observe the Dresden skyline. The transparent wedge brings daylight from all angles into each floor of the historic building. The outer shell is encased by a screen of thin steel rods, which filter in the daylight. A second, larger steel grid inside provides structural support and pattern to the wedge. The halls and floors below the new addition are angled as well, with thin strips of skylights, that leak daylight into the hallways below. New exhibitions will be shown in Libeskind’s addition, which are separated by exposed concrete from the historic galleries, which includes the first German submarine, the Brandtaucher, built in 1850. The Dresden Museum of Military History was once Germany’s center for military pride. Libeskind’s addition to is meant to be a literal visual representation of the interruption of Germany’s proud military history, due to the atrocities of the Nazi party. The addition is symbolic, beautiful, and also makes the museum Germany’s largest.